With his past forays into punk and dance-pop, rocker Billy Idol proved his mettle as a gifted style surfer: one who never creates the wave, but who rides it expertly, milking its motion for his own progress. Idol’s new CD, "Cyberpunk," demands recognition as a style setter, not for its musical content, but for the changes it may prompt in the ways recordings are made and marketed, changes that hint at the possibilities explored in William Gibson’s 1985 novel, "Neuromancer." In "Neuromancer," multinational firms oversee the production and storage of information, reaping billions by controlling its flow. Cyberpunks seek to divert the flow to benefit society and, occasionally, to benefit themselves. Special copies of "Cyberpunk" contain a computer floppy disk that compactly combines full lyrics, a biography, wild graphics, snippets of sound from the CD and a bibliography for compuphiles to learn more about computer subculture—soon to lose the sub. The album will be released early next month with promotions at computer stores as well as record stores. Idol plans to plug the album with a fall arena tour featuring "swarm cams": 20 small computer-controlled video cameras that send swirling electronically altered images to giant screens flanking the stage. Megacorporations are the new government; computer-generated info domains are the new frontiers. Information is the power and currency of the virtual world we inhabit. So we mistrust authority, cyberpunks are the true rebels and cyberculture is coming under the radar of ordinary society. These and other cyberslogans appear throughout the bio disc, which contains lyrics accented with quotes and Idol’s musings on his newest embrace of counterculture. Idol wisely harnessed some of the hottest minds in West Coast cyberpunk, among them Jaime Levy, 27, a Los Angeles native who publishes books and magazines on floppy discs under the Electronic Hollywood imprint. "He bought one of my discs at a bookstore in Hollywood," Levy said, "and he called everybody together at his house in the Hollywood Hills to have a cyber-meeting, although it turned into more of a party." Floating around Idol’s living room were 60s acid-scene guru Dr Timothy Leary; R U Sirius, editor of the hacker magazine Mondo 2000; and Brett Leonard, director of the futuristic film "Lawnmower Man" and of Idol’s latest video. As for the bio disc, Levy said, "it’s a really good way of putting out information cheaply. Discs cost about 60 cents and the information never has to be on paper. If someone doesn’t like what you’re doing, they can reuse the disc." Fran Musso, vice president of product development at EMI Records, hopes Idol’s audience likes what he’s doing enough to enable "Cyberpunk" to set another trend. 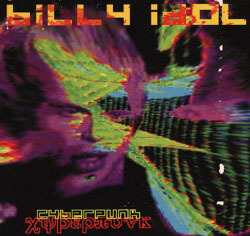 If demand is high, "Cyberpunk" may be one of the few mass-market albums released on CD-ROM, a computer displayed format that is a close cousin to the compact disc widely in use. Rock artists Peter Gabriel and Todd Rundgren have experimented with the format’s promising data-storage capabilities, but CD-ROM is still a high-priced accessory for most home computer users. Musso said the label will decide later this year whether to offer CD-ROM. "It depends on the market and how this project does. We may do it next year or as early as Christmas."